Organize your favorite spices and have them conveniently close at hand with this 4 tier wire wall mounted storage rack. The rack is made of metal chicken wire with a casual design to give a little bit of country chic. Easy to install by simply mounting to your cabinet, pantry door or to a wall, each shelf accommodates most standard spice jars. Can also be used to store other items. Spice jars are not included. SPECS: 17 W X 20.75 H X 2.2 D (in inches). 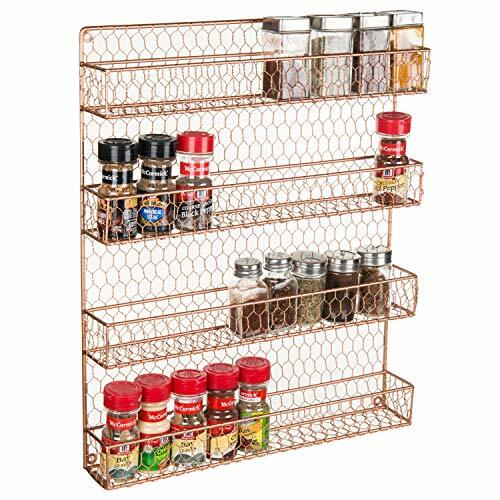 COUNTRY RUSTIC SPICE RACK: 4 tier chicken wire wall mounted, cabinet or pantry storage rack for organizing all your favorite spices and have them conveniently close at hand. FITS STANDARD SIZE JARS: Each shelf accommodates most standard spice jars. Spice jars are not included. METAL WIRE DESIGN: Country rustic metal chicken wire design.